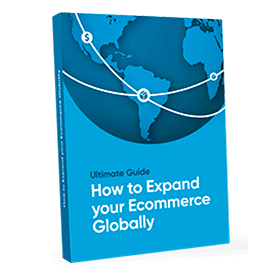 Research shows that the world’s largest cross-border ecommerce markets are USA, UK, Germany, Australia, China & Brazil, today these six markets add up to 94 million cross-border shoppers. In 2015 they spent a total of USD 105 billion, equal to 16% of the world’s online shopping. By 2018 there will be 130 million eshoppers in these same markets and they are expected to spend nearly 3 times as much, USD 307 billion in cross-border purchases. The size of the Brazilian ecommerce Market: Ecommerce in Brazil has reached a high level of maturity, Brazilians are feeling increasingly comfortable doing online shopping, security measures to prevent fraud are commonly implemented, logistics and payments infrastructure barriers are being torn down, furthermore, Brazil’s large millennial population- 42%, guarantees that ecommerce will continue its double digit growth in the years to come. A booming ecommerce amid a crisis. The economic boom Brazil experienced in the turn of the century heavily depended on the appetite of the Chinese economy and the stimulus of private consumption through credit. Since 2014 the economic performance of the country worsen and degraded into political instability making 2016, the worst year for the economy so far. Fortunately, in 2017 the outlook is better when the economy is expected to recover, the currency and inflation are expected to stabilize and ecommerce is expected to grow 12%, that is 2% more than in 2016, reaching by 2019 USD 40 billion in sales. Ecommerce in Brazil mimics the behaviour of the GDP, and it is heavily correlated to the strength of the Real. 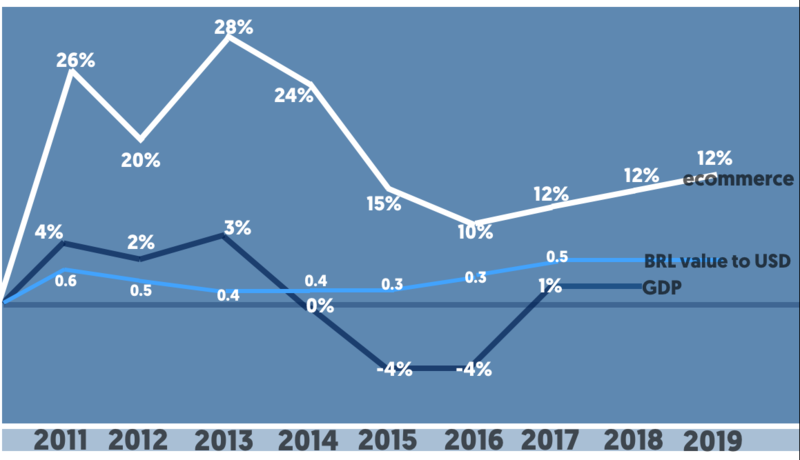 Despite the deepest economic recession since 1930, ecommerce growth has such momentum that it never stopped growing double digits throughout the crisis, 10% in 2015. . 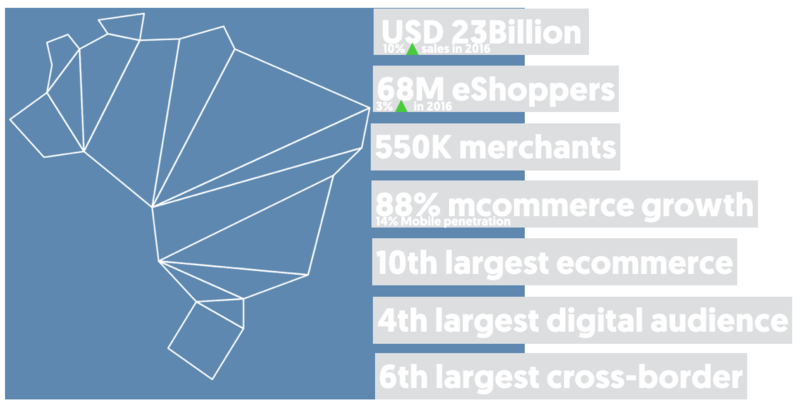 The 6th largest cross-border ecommerce market. Today cross-border sales in Brazil represent 15% of total ecommerce sales, and it is a segment that grows faster than overall ecommerce, 18% in 2015, making it the 6th largest cross-border market in the planet, after the United States, Australia, UK, Germany and China. Research shows that in 2015, 54% of Brazil’s online shoppers made at least one cross-border purchase, compared to 34% in 2014. Brazilians are now willing to purchase anything from abroad from durable goods to services. Brazilians have moved their purchases from the streets to the internet to make the most out of their available incomes, and buying from international stores gives them access to a larger variety of goods & services generally at better prices than local brick-and-mortar stores. Cross-border payment strategy vs local payment strategy. Put simply, a cross-border payment is a payment captured by an international acquirer, when a transaction is done in such a manner, Brazilian revenue agency considers it an international transaction and a Federal IOF tax of 6.38% applies to such purchases, in addition, only international credit cards can be processed by international acquirers, which limits the market size to less than 30%. 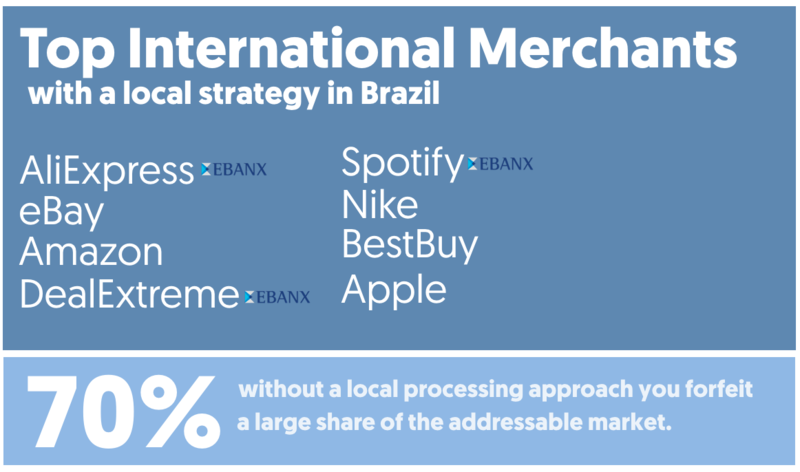 To seize the potential of the Brazilian market, international merchants must adopt a local payment strategy, which allows for a lighter tax footprint, since all transactions are processed domestically, the Federal IOF tax applicable is considerably less, making your products cheaper. Want to know further about the subject? Check out this article I wrote with some other insights for you to start selling to Latin America.